Wouldn't life be simpler if you could pay by card everywhere? It's quick, easy, and secure. But what about when you need to pay back a friend for dinner, and you realise you have no cash in your wallet? Or you fancy a packet of crisps, and you reach the till at the corner shop only to find that it's either cash-only, or even worse, there's a £10 minimum card spend or a card fee. If only everywhere and everyone accepted card payments. Think of all the time you'd save from not having to find an ATM. No more chasing your friends for their bank details to make a transfer. None of that sinking feeling when you realise that cheque you've been meaning to deposit expired two months ago. With Lydia, the only thing you need to make or receive a payment is already in your hands. 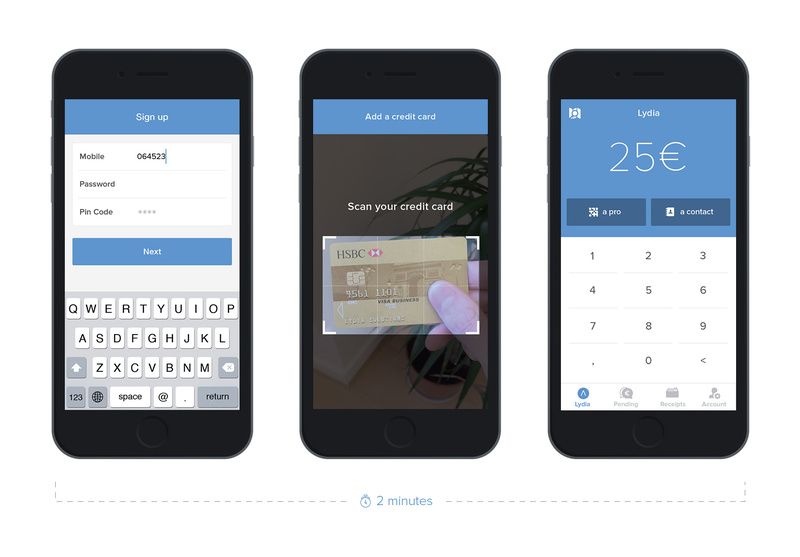 From now on, you can use your smartphone to pay friends and businesses by card. Lydia works with iOS and Android. That's it, you're now set to make mobile payments. Paying has never been this fun. 1. Works on all iOS and Android phones. You might have a great phone, but it's not the right model, or you don't have the right operator, or the right bank to let you make mobile payments. That's why we chose the QR code. It's simple, fast, and compatible with all devices. You just have to scan it, and it even works when you have no network. 2. Uses your phone contacts. Chances are that you already have your friends' numbers on your phone; you're less likely to have saved their bank details. When you want to send them money, instead of asking you for an account number and sort code, we just use their mobile number. It's more practical. 3. Pay by card. We chose debit and credit card since it's an established payments system that we're used to using to pay online. This means that the payments you make with Lydia work in exactly the same way as card payments - i.e. with the same level of security, payment limits, and guarantees. When you use Lydia, the card you've chosen is instantly debited, and the amount transferred to the recipient’s account, just like when you pay in store - but a lot simpler. If you’re paying back a friend, the money will be immediately credited to their Lydia account. They'll get an SMS or email nofication saying that they can transfer the money to their bank account or use it to pay with Lydia. In the meantime, the money will be securely stored at BNP-Paribas and guaranteed by the Societe Financiere du Porte-Monnaie Electronique Interbancaire (SFPMEI). The age-old problem with the latest apps is that they only really work if you can get your friends download them, too. For Lydia, that's only true for our Lydia Pro app for businesses. They just have to download the Lydia Pro app or activate Lydia in their till system to accept mobile payments. However, it's very quick. You might have an appointment at a hairdresser who has never heard of Lydia when you arrive, and by the time your haircut is over, you'll be able to pay for it by Lydia. It takes under two minutes to create and activate an account. It's just up to you to convince them. On the other hand, if you need to pay back a friend or get back paid back, they don't need to have the app at all. When you send money to a contact who does not have Lydia, they will get an SMS or email with a link to a secure online page, whether they just need to enter the details for the bank account to which they'd like the money to be transferred. It's just as simple when you need a friend to pay you back. They'll get sent a link, and just need to enter their card details on a secure online page. Just like a classic online payment. Once your friends see how easy it is, we suspect they'll download Lydia, too. We're pretty proud of our technology, but it wouldn't be much without a reliable and secure banking system that processes and guarantees all of our electronic transaction in the space of milliseconds. We work with the most advanced, preeminent financial partners in Europe.